Grimoricon: Pathway to Terah is an epic fantasy novel for preteens and children, grades 4-6, written by B.D. Suever. Ethan was your typical twelve-year-old, if having already developed a passion for reading could be considered typical. That aside, he lived for playing video games, especially Dark Torment, and he had developed an unfortunately typical penchant for being a wise guy. That got him into trouble when he and his dad went into the antiques shop that afternoon. Ethan was instantly drawn to the store’s extensive collection of old books, and, being a wise guy, he paid little attention to the mess he was making of the store’s display as he browsed. That and his rudeness to the storekeeper led to him being sent to bed without access to the strange and intriguing old book he had bought that afternoon and his video game. B.D. 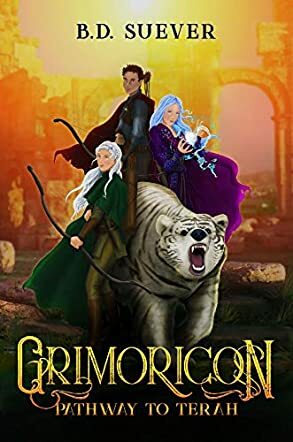 Suever’s Grimoricon: Pathway to Terah is an imaginative and exciting quest fantasy wherein a smart-alecky twelve-year-old must master his fear and lack of confidence and find a way to save the beings he comes to care about. Suever’s fantasy world is richly imagined and filled with all manner of good and evil creatures, and his characters are multifaceted and believable. The plot is ingenious, and Suever’s storytelling skills quickly had me as engrossed in his tale as young Ethan is in the storybook he found in the store. I especially enjoyed seeing how Ethan utilizes the tactical and strategy skills gained from his video games while facing the challenges of Terah. While the book is geared toward a younger audience, I wouldn’t hesitate to recommend it to anyone who enjoys epic fantasy, particularly coming of age quest tales and fantasy video gaming. Grimoricon: Pathway to Terah is most highly recommended. What a great fantasy. Looking forward to what comes next for Ethan !! Enjoyed this story of Ethans adventures .Felt like I knew these characters . Great author! Looking forward to the next!